Oftentimes, 3-row crossover SUVs claim to seat 7 people, but are really suitable for only 4 adults and 3 children. The 2014 Santa Fe is an exception in that it accommodates 6 sizable people in 3 rows of seats. Before you choke on the price tag affixed to a 2014 Hyundai Santa Fe, remember that it is now packaged, priced and positioned to compete against other midsize, 3-row, 7-passenger SUVs. Not only that, the stylish Santa Fe is more sophisticated than expected, roomier and more comfortable than several of its competitors, and makes plenty of sense in terms of safety and cost of ownership. Stylish design and engaging driving dynamics add a layer of emotional attachment to what is an exceptionally practical vehicle. Everybody seems to want a crossover SUV with 3 rows of seating, yet nobody seemed to want Hyundai’s virtually ignored offering along such lines, the surprisingly sophisticated Veracruz. 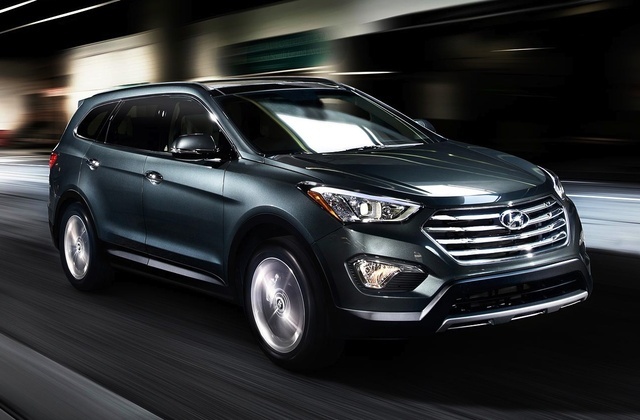 Last year, Hyundai replaced the Veracruz with the completely redesigned and equally refined Santa Fe, which returns for the 2014 model year with several updates. Hyundai’s Santa Fe lineup is comprised of the 5-passenger Santa Fe Sport and the larger 7-passenger Santa Fe. The Santa Fe Sport model has different styling, different powertrains and a different personality, and it competes against a different set of crossover SUVs. This review is focused on the bigger Santa Fe, which debuted a half-year after the Santa Fe Sport. Prices start at $30,655 for the Santa Fe GLS, which is offered with optional all-wheel drive ($1,750), a Premium Package ($3,550), a Technology Package ($4,000) and a handful of dealer-installed extras. 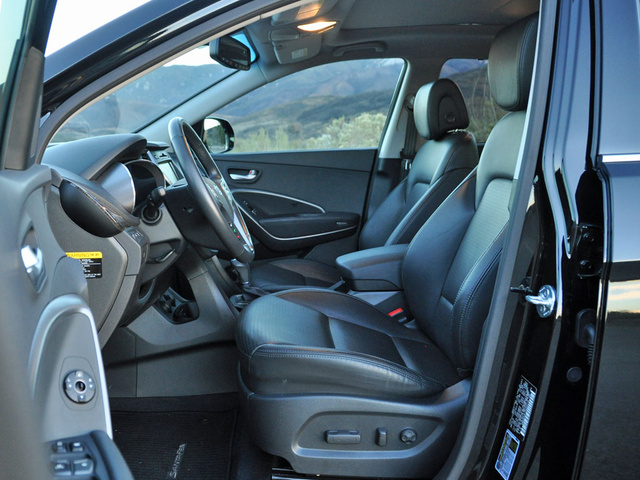 My test vehicle was the Santa Fe Limited ($34,555), which adds the contents of the GLS model’s Premium Package plus exclusive second-row captain’s chairs. That means the Limited model is equipped with leather seats, a power front passenger’s seat, second-row captain’s chairs, dual-zone automatic climate control, keyless passive entry with push-button start, a power liftgate, a blind-spot information system, upgraded instrumentation, manual rear side window sunshades, an auto-dimming rear-view mirror with a compass, a universal garage door opener and more. Both versions of the Santa Fe are available with an optional Technology Package. For the Santa Fe GLS, this upgrade costs $4,000, requires the purchase of the Premium Package and includes 19-inch aluminum wheels, a panoramic glass sunroof, a navigation system with an 8-inch touchscreen display, a better sound system, ventilated front seats, heated second-row seats, a heated steering wheel, a 115-volt power outlet and more. For the Santa Fe Limited, this package runs $4,850 and also installs HID headlights, LED taillights and a premium Surround Sound audio system. 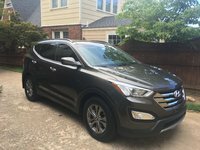 My Santa Fe Limited test vehicle had front-wheel drive and the optional Technology Package, and it was painted Becketts Black with a Black leather interior. With the dealer-installed floor mats and rear bumper protective applique, the total price came to $39,590. Personally, I prefer the look of the bigger Santa Fe to the Santa Fe Sport. On the smaller, shorter and narrower Sport model, certain styling elements appear to be oversized, whereas on the Santa Fe they are proportioned just right. Both models mark a Hyundai design transition away from the “Fluidic Sculpture” styling elements best characterized by the Elantra and Sonata sedans to what the automaker calls a “Storm Edge” design language. In any case, the 7-passenger Santa Fe is really a good-looking crossover SUV, distinctive without resorting to trite tricks, and the 19-inch wheels included in the Technology Packages are perfect in terms of size, appearance and finish. Inside, Hyundai employs unfailingly symmetrical design that suffers in terms of ergonomics (more to come on this in a bit). 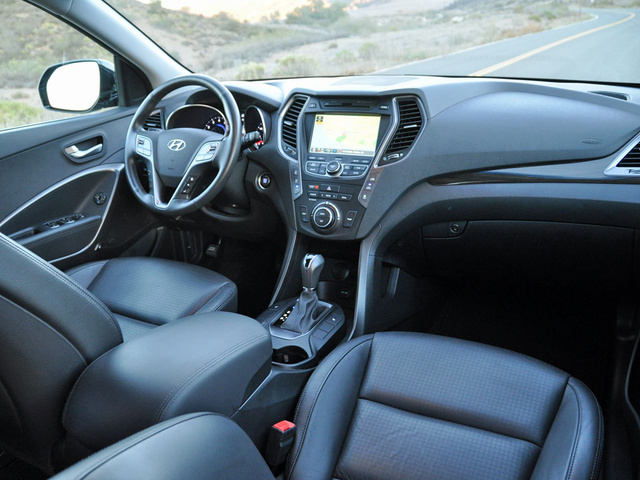 Thanks to creative use of texture, pattern and trim, there’s plenty of visual contrast inside the Santa Fe’s cabin, even with my test vehicle’s Black interior color, and the interior looks suitably upscale thanks to details like convincing wood trim, tasteful silver accents and Berber-style floor mats. A Saddle-colored leather is unique to the Limited, and buyers can also get a Gray or Beige interior, depending on exterior color selection. In addition to adding big 19-inch wheels, the Santa Fe’s Technology Package includes a massive panoramic sunroof that lets in plenty of light during the day and serves as a source of entertainment and wonder for children riding in the rear seats. Unlike the Santa Fe Sport, which is offered with a choice between standard and turbocharged 4-cylinder engines, the bigger Santa Fe gets a 3.3-liter V6 engine making 290 horsepower at 6,400 rpm and 252 lb-ft of torque at 5,200 rpm, making this one of the more powerful crossover SUVs in the segment. A 6-speed automatic transmission with Shiftronic manual-shift capability delivers the power to the Santa Fe’s front wheels and includes an Active Eco driving mode that calibrates shifting to maximize fuel economy. The manual shift gate offers an intuitive shift pattern: Push up on the gear selector to execute an upshift, pull down to execute a downshift. Both Hillstart Assist Control and Downhill Assist Control are standard, and when properly equipped a Santa Fe can tow up to 5,000 pounds. An optional Active Cornering Control all-wheel-drive (AWD) system continuously monitors driving conditions to maximize traction and employs torque vectoring to reduce oversteer and understeer when taking corners or accelerating in order to improve the Santa Fe’s handling and stability. As a result, Hyundai claims its AWD system is more sophisticated than what the competition offers. According to the EPA, the Santa Fe is rated to get between 18 mpg in the city and 25 mpg on the highway (24 mpg highway with AWD). My front-drive test vehicle averaged 20.9 mpg, nearly matching the EPA’s combined-driving rating of 21 mpg. Keep in mind, though, that many of those miles were covered on the highway with the Active Eco mode engaged. The Santa Fe’s 3.3-liter V6 is a strong and refined engine, and the 6-speed automatic transmission shifts quickly and smoothly regardless of whether the driver is attempting to maximize acceleration for merging or passing, or is loafing along in rush-hour traffic. On hills, the transmission is designed to hold a lower gear in order to maintain speed going up and to employ engine braking to reduce speed going down, and when shuttling a full load of adults and teenagers, the Santa Fe never felt winded in the hilly terrain of California’s Orange County area. Notably, neither of the powertrain components generates much in the way of noise, vibration or harshness, making the Santa Fe’s cabin a pleasing place to spend time. Equipped with a 4-wheel-independent suspension and 19-inch aluminum wheels with P235/55R19 Kumho City Venture Premium tires, the Santa Fe provides plenty of grip in turns, making this 2-ton SUV feel athletic and responsive around city corners and mountain curves. There is a hint of dissonance in the suspension tuning, in that the Santa Fe feels a little too firm over sharper bumps and a little too woozy over dips, but in general the ride/handling mix is commendable. Electric steering is standard and features a Driver Selectable Steering Mode with Comfort, Normal and Sport settings. My favorite is Comfort, because I find that it feels the most natural regardless of vehicle speed, and because it allows for easy fine-tuning while traveling in a straight line. Normal and Sport modes add artificial heft right off center, making the steering feel a little loose and sloppy when going down the highway while at the same time making the steering more resistant to minor corrections. Stout brakes are standard equipment, with ventilated discs up front and smaller solid discs in back. Electronic brakeforce distribution and brake assist are also included, and the Santa Fe has no trouble stopping at a moment’s notice. I did, however, find that the pedal was occasionally difficult to modulate. Most of the time this wasn’t an issue, but on occasion the pedal felt unresponsive and then grabby, such as when releasing the brakes to make a right turn on a red light and then re-applying them when more traffic appeared from behind other vehicles. Oftentimes, 3-row crossover SUVs claim to seat 7 people but are really suitable for only 4 adults and 3 children. The 2014 Santa Fe is an exception in that it accommodates 6 sizable people in 3 rows of seats. Starting up front, the driver sits on an 8-way power adjustable seat with 4-way power lumbar support, which is standard in every version of the Santa Fe, and faces a standard tilt/telescopic steering wheel. If you can’t get comfortable in the driver’s seat, you’re not trying hard enough. The GLS trim is equipped with stain-resistant fabric, but the GLS Premium Package and all Santa Fe Limited versions are equipped with supple leather seats. Comfort levels are also improved this year, because in addition to the heated seat and heated steering wheel that are included in the Technology Package, Hyundai provides seat ventilation for the 2014 model year. Unfortunately, the front passenger seat does not prove to be as pleasing. I had the Santa Fe over the Thanksgiving holiday, and lots of family members rode shotgun. Every single person who got into the Santa Fe Limited’s power-adjustable front passenger seat commented on how low they sat to the floor, and all of them wished the chair was height-adjustable. In fact, my wife said this particular flaw would automatically eliminate the Santa Fe from our personal consideration list if we were in the market for a new crossover SUV. I would strongly urge Hyundai to correct this, ASAP. Moving to the Santa Fe’s second-row seat, it offers a 40:20:40-split design in the GLS model, while my Limited test vehicle had captain’s chairs with inboard armrests that offered terrific thigh support and impressive comfort. Better yet, the captain’s chairs slide forward and back to provide the right amount of legroom for all passengers. 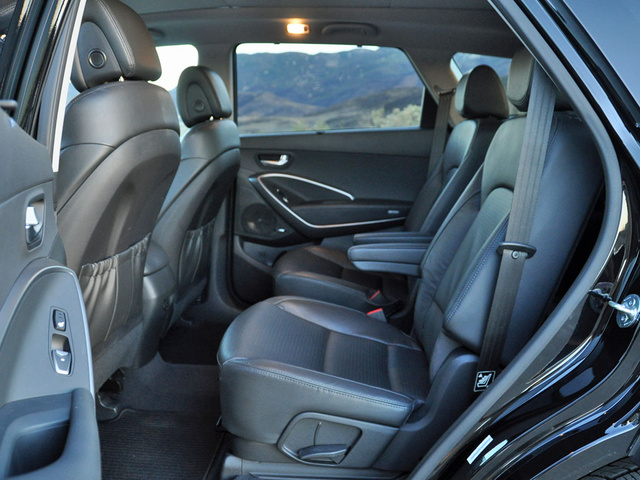 If you’re traveling with 4 people aboard, slide the seats all the way back to enjoy limo-like levels of room. If you’re adding passengers to the third-row seat, slide them forward to increase comfort for the extra riders. Install the Technology Package, and second-row occupants ride on heated seats with a panoramic view thorough the enormous sunroof. During my week with the Santa Fe, limber teens clambered aboard and into the third-row seat with little effort. Expectedly, the rearmost seat’s bottom cushion is rather flat and featureless in order to provide a flat cargo floor when folded. Unexpectedly, legroom is decent even with the second-row seats moved all the way back in their tracks, and there is even a little bit of toe room under the second-row chairs. Plus, thanks to the captain’s chairs, it is easy for third-row passengers to stretch at least one leg straight. The view out is good, too, thanks to the large side window. Like other crossover SUVs with 3 rows of seats, with the Santa Fe you need to decide whether you want to carry extra people or extra cargo. Behind the third-row seat, the Hyundai provides 13.5 cubic feet of cargo space, measured to the ceiling. Practically speaking, that’s not much. 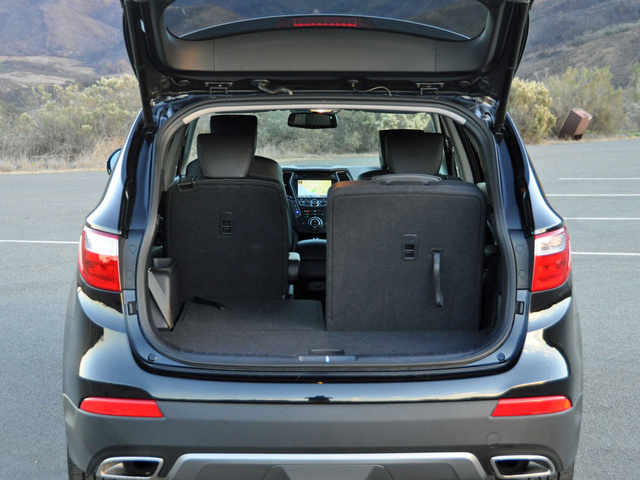 Fold the 50:50-split third-row seat down, though, and the Santa Fe provides an impressive 40.9 cubic feet of space. Fold all the seats, and room nearly doubles to 80 cubes of cargo volume, easily putting the Santa Fe on par with competing models. If the Santa Fe offers an impressive blend of passenger-hauling and cargo-toting capability, I find the symmetrical control layout to be a bit daunting. Even after hundreds of holiday-week miles, I still had trouble finding, referencing and using certain features, especially at night when the driver faces a constellation of beautifully illuminated but sometimes indistinguishable controls. In a nutshell, intuition is not the best guide when operating a Santa Fe, because the controls are often mixed and matched rather than logically grouped. You might expect to find the heated steering wheel activation button, which is used frequently, on the steering wheel. Instead, the Driver Selectable Steering Mode button is on the steering wheel, and the heated steering wheel button is hidden on the left portion of the dashboard next to the Active Eco button. You might also reach for the large rotary knob to adjust the automatic climate-control system’s temperature, but that changes fan speed and turns the automatic part of the system off. To adjust temperature, use the rocker switches flanking the system’s primary controls. A rocker switch is also employed for tuning the radio and is grouped with the navigation controls instead of the radio controls. A knob would certainly be more intuitive. As for the infotainment system’s touchscreen controls, they require a degree of concentration that can be dangerous when you’re whistling down L.A.’s 405 freeway during one of those rare moments in time that traffic is actually moving at a pace above the posted limit. Perhaps owners might get used to the Santa Fe’s control layout, but I spent lots of quality time in this test vehicle and kept forgetting where things were and how they worked. If the Santa Fe’s controls aren’t necessarily intuitive in terms of layout, the technology is straightforward in terms of operation. Even a simple guy like me can figure everything out without cracking open the owner’s manual, from streaming my iTunes library or Pandora Internet radio to making voice-activated phone calls using my downloaded contacts list. Tech-related options include HD Radio, two audio system upgrades including a Surround Sound system and a navigation and infotainment system with an 8-inch color touchscreen display. A reversing camera and a blind-spot information system are also available for the 2014 Santa Fe, but one thing families might want that Hyundai doesn’t supply is a rear-seat entertainment system. Refreshingly, the 2014 Santa Fe is equipped with the standard and optional safety features that are the most useful to people, without the extraneous costs of semi-autonomous technologies that are primarily beneficial to drivers who don’t pay attention when they’re driving. Indeed, when driving a loaded Santa Fe, you’ll never want to shut the safety nannies off, because they effectively serve practical purposes. Highlights include an available reversing camera, rear parking assist sensors and a blind-spot information system. Additionally, every Santa Fe is equipped with Blue Link telematics with 3 free years of Assurance Connected Care service, which includes Automatic Collision Notification and SOS Emergency Assistance, among other features. If there’s room for improvement, I’d like to see Hyundai upgrade the reversing camera to provide a 180-degree field of vision and add active headlights that swivel to help see around dark corners and that automatically adjust between high-beam and low-beam illumination depending on driving conditions. As this review is written, the National Highway Traffic Safety Administration (NHTSA) has not performed crash tests on the 7-passenger Santa Fe. The Insurance Institute for Highway Safety (IIHS) has tested the 5-passenger Santa Fe Sport and does not make a distinction between the smaller Sport model and the larger Santa Fe model. In IIHS testing, then, the Santa Fe received the highest rating of Good in 4 of 5 tests. The IIHS had not assessed the Santa Fe in the difficult new small-overlap frontal-impact crash test as this review was published, and so the rating published here is based solely on available features and existing crash-test results. If you’re of the mindset that the Hyundai Santa Fe ought to be priced lower than its competition because it hails from a Korean automaker, you’ll need to readjust your way of thinking. Now that Hyundai and Kia are building world-class cars and SUVs, they command prices properly calibrated to their competition. In the Santa Fe’s case, that includes the Dodge Durango, Ford Explorer, Honda Pilot, Mazda CX-9, Nissan Pathfinder and Toyota Highlander. 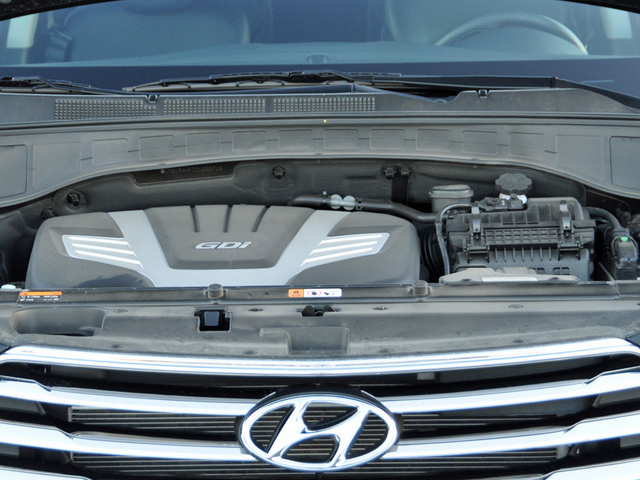 Where Hyundai trumps those models is with regard to warranty coverage. The entire vehicle includes a 5-year/60,000-mile limited warranty, and Hyundai supplies free roadside assistance for 5 years with no mileage limit. The powertrain warranty lasts for 10 years or 100,000 miles. Add this level of protection to the 3-year Blue Link service period, and the Santa Fe provides uncommon peace of mind. 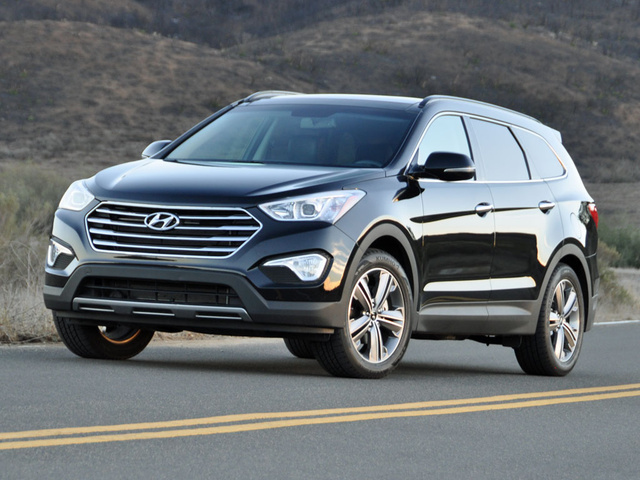 In terms of reliability, the Santa Fe receives average predictions from Consumer Reports and J.D. Power. In last year’s Initial Quality Study from J.D. Power, though, the redesigned version of the SUV rated “better than most,” which may signal improvement in terms of future dependability. When it comes to costs of ownership, the Santa Fe enjoys below-average costs for insurance according to State Farm and does a better-than-average job of retaining its value based on ALG depreciation ratings. Still, Hyundai apparently isn’t having any trouble selling the Santa Fe, so aside from lease specials and a Hyundai owner loyalty coupon, deals aren’t readily available in the same way they are for the competition. That’s one reason why TrueCar says Santa Fe transaction prices are trending $200-$300 above dealer invoice as I write this review. As far as fuel economy is concerned, the Santa Fe hits its EPA targets, a rarity for a Hyundai product. Rated to get 21 mpg in combined driving, the Santa Fe returned 20.9 mpg over the course of hundreds of miles of driving. On my test loop, the Hyundai delivered 18.2 mpg in the city and suburbs and averaged 21.2 mpg for the entire loop despite a total of 1,500 feet in elevation change. 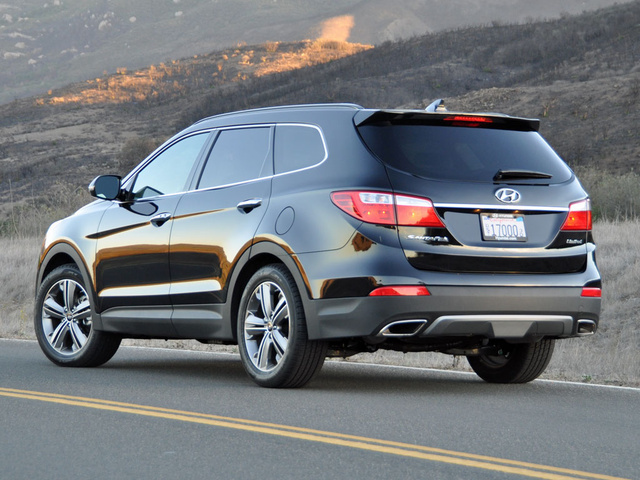 What's your take on the 2014 Hyundai Santa Fe? GuruYFYJX Car is great !!!! Bluelink is a piece of "CRAP"
Have you driven a 2014 Hyundai Santa Fe? I locked the keys inside my Hyundai Santa Fe with the motor running. How can that happen? But more importantly, how do I get inside? How do I unlock it? Any ideas why the module 3 10 amp fuse would keep blowing in my 2014 Hyundai Santa Fe?